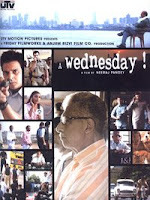 Debutant director Neeraj Pandey scripts and directs this delightful peice of cinema. A simple concept and story idea is developed into a tight thrilling script, however improbable the tale might seem. Starring Naseeruddin Shah, Anupam Kher, Jimmy Shergill and Aamir Bashir the movie deals with urban terrorism. On a Wednesday the commissioner of Mumabi City Police receives a call taht there are bombs planted all over Mumbai and will go off if his demans of releasing a few terrorists are not met. Who s the faceless man ? is he the mastermind ? is he a specialist hired by terrorist groups ? The commissioner (Anupam Kher) has to call in his best men , Arif Khan (Jimmy Shergill) violent and ruthless and Jai Pratap Singh (Aamir Bashir) straightforwarda nd restrained. Will they be able to stop this nameless man in time to save Mumbai or will they ahve to give in and release the terrorists responsible for the death of many ? The end of the Wednesday will tell. Brilliant scripting, performances, direction. I wonder sometimes how do these debutant directos/writers come up with such delicious peices of work and get all the elements right.